The audio of Vijay’s Bairavaa is all set to hit the stores on the 23rd of December. With hardly four days to go, it is time we get to know more about the audio tracklist details. We are told that the film comprises of 4 songs and one theme track. All the songs are penned by veteran lyricist Vairamuthu. 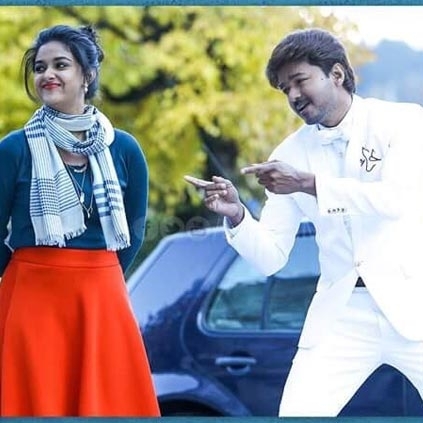 The team just revealed the details about the first song of Bairavaa along with a new photo. The song goes by the title, ‘Azhagiya Soodana Poovey’ which translates into English as ‘beautiful hot flower’. Vijaynarain and Dharshana KT have lent their voices for this track composed by Santhosh Narayanan. Complete tracklist of Bairavaa is expected to be announced by 5 PM today. Stay tuned for more updates!